A map of Númenor in the Second Age. Númenor is a fictional island in J. R. R. Tolkien's Middle-earth world. It was an island west of Middle-earth in the Second Age, inhabited by Men, and with a history reminiscent of Atlantis. The Akallabêth is the story of Númenor's history and Downfall. 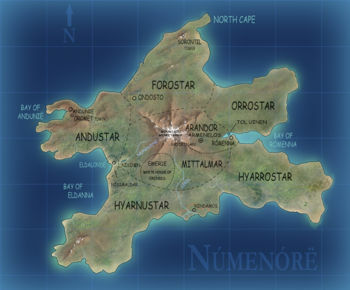 Númenor was a great island in the Seas west of Middle-earth, in the shape of a five-pointed star. In the middle of the island was the volcanic mountain Meneltarma, which was a sacred place for the Númenóreans. The land was divided into six regions, one in each "star-arm" and one in the middle. The regions were Forostar ("Northlands"), Andustar ("Westlands"), Hyarnustar ("Southwestlands"), Hyarrostar ("Southeastlands"), Orrostar ("Eastlands"), and the central region Mittalmar ("Inlands"). In eastern Mittalmar was the region Arandor ("Kingsland"), which was under the direct rule of the King. The capital city Armenelos lay in Arandor, as well as the haven Rómenna. Some of the many names of Númenor were Westernesse, Númenórë (Quenya, the long form of Númenor) and Anadûnê (Adûnaic), both meaning "West-land"; Andor (Quenya) and Yôzâyan (Adûnaic), which both mean "the Land of the Gift". Later it was also called Atalantë (Quenya) and Akallabêth (Adûnaic), both meaning "the Downfallen". The inhabitants of Númenor were usually called the Númenóreans or Men of the West. At the beginning of the Second Age the island was given to the Edain, the human peoples who had helped the Elves in the wars against Morgoth during the First Age. The first Númenórean King was Elros Tar-Minyatur, brother of Elrond. Númenor prospered into a wealthy and sophisticated nation, especially known for their seafaring. Númenor established colonies on the shores of Middle-earth, from Eriador to Harad in the far south. They also assisted the Elves in their wars against Sauron. In the later part of the Second Age, many Númenóreans became jealous of the Elves and became hostile to the Elves and Valar. The people were divided into two fractions, the Elendili ("Elf-friends"), also called the Faithful because of their loyalty to the Elves and the West, and the King's Men who rejected the West. Toward the end of the Age the King Tar-Palantir returned Númenor to the old ways of the Faithful for a time. Although his daughter Míriel was supposed to succeed him, his nephew Ar-Pharazôn usurped the throne after Tar-Palantir's death. Ar-Pharazôn landed with a great fleet at Umbar and marched to Mordor, where Sauron surrendered to him, and returned with the King to Númenor. Sauron over time corrupted Ar-Pharazôn so he became worse than any before him, hunting the Elendili and worshipping Melkor. At last Ar-Pharazôn built the greatest fleet the world had seen, and sailed to Aman to wage war on the Valar. As a result, and punishment, the island Númenor sank into the Sea. The remaining Elendili had been warned before, and escaped the Downfall of Númenor. Led by Elendil and his sons, they sailed to Middle-earth, where they established the Dúnedain kingdoms of Arnor and Gondor. Remnants of the King's Men continued in the southern colonies on the coast of Harad, who became known as the Black Númenóreans, who in times to come were loyal to Sauron and enemies of Gondor. This page was last modified on 23 July 2017, at 08:49. This page has been accessed 13,337 times.